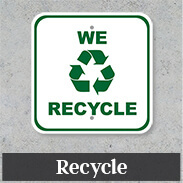 CustomSigns.com has a line of quality aluminum outdoor private property signs that can be customized and laminated for protection from weather and outdoor elements. If you are having trouble with unwanted visitors on your private property or private road, one of our property signs can help. 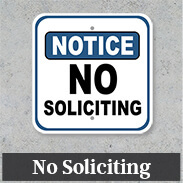 We offer notice signs for private property, featuring a bold "NO TRESPASSING" message. Also see our warning sign that reads in bold all capital letters, "PRIVATE ROAD, NO TRESPASSING." 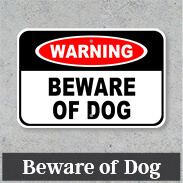 No trespassing signs can help prevent liability associated with owning private property. Some of the concerns with being a property owner include vandalism, theft and hunting and fishing. 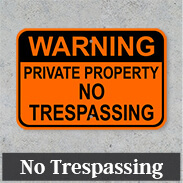 Make it clear that your property is private by posting no trespassing signs and maintaining them. This includes updating and keeping them in clear view. 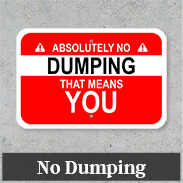 Make sure shrubs and bushes are not hiding your no trespassing signs. 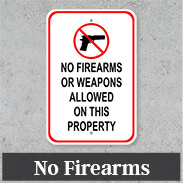 Depending on which state you live in, no trespassing laws and associated signage, may differ. 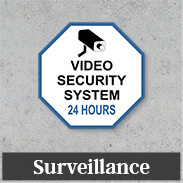 You can also let potential intruders know that they're being watched by a surveillance camera. 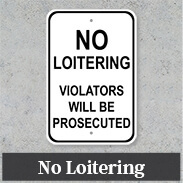 Mark your private property and business property with an array of signs featuring parking, no trespassing, custom street signs, and customized business exterior signs. Looking for a product not listed here? Simply email our team using the link above or call (877) 251-9444 and we will provide fast, efficient service to help get your order started.